Easter is a Christian holiday that celebrates the resurrection of Jesus Christ from the dead. The Friday before Easter is called Good Friday. It is the day that Jesus was crucified on the cross at Calvary. Easter day moves around on the calendar each year, but is always on a Sunday. It is celebrated on the first Sunday following the full moon after the vernal equinox. It can occur anytime between March 22nd and April 25th. The day is celebrated by Christians throughout the world. It is the most important of the Christian holidays. It is also celebrated by many other people as a fun spring holiday. Many people go to church on Sunday to celebrate the resurrection of Jesus Christ. A lot of people travel to visit with family and relatives over the Easter weekend as well. After church there are often family reunions and large meals to celebrate the occasion. In addition to the religious celebrations and significance of the holiday, there are some secular traditions. These include the Easter Egg Hunt. 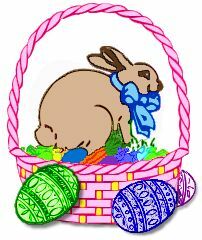 Tradition says that the Easter bunny hides eggs for children to find each year. In the United States these eggs are often candy or chocolate. Kids search for the candy, usually outdoors, and put the candy and eggs they find into their Easter basket. Other traditions include the Easter Egg Roll at the White House, Easter baskets with chocolate Easter bunnies, decorating hard boiled eggs, and Easter lily flowers. There is also a large Easter parade that takes place in New York City each year. In the Christian faith Jesus Christ is the Son of God who came to live on Earth as a man. At around the age of 33, Jesus had become famous in Israel and had gained many followers. The leaders in Jerusalem did not like Jesus because he claimed to be the Son of God. They captured Jesus and took him to the local Roman leader Pontius Pilate. Pilate couldn't find that Jesus did anything wrong. However, he eventually allowed Jesus to be crucified. After three days, the tomb of Jesus was found to be empty. Many Jewish and Roman people said that the disciples must have stolen the body. However, hundreds of people claimed to have seen Jesus alive and well. Around 40 days later, Jesus ascended into heaven. Jesus' death and resurrection is a very important part of the Christian faith. Jesus was perfect and never sinned in his life. At the same time, every other man has sinned and this sin separates man from God. Since Jesus was perfect, he could die in our place. When Jesus died on the cross, he died as a sacrifice for the sins of all people. When he rose again on Easter, Jesus conquered death. Around 90 million chocolate Easter bunnies are made for the holiday each year. The largest Easter egg ever made was over 25 feet high! Orthodox Christians in some countries use a different calendar and celebrate Easter a few weeks later than the United States. The Sunday before Easter is called Palm Sunday. This is because when Jesus entered Jerusalem on that day the people put palms on the ground in front of the donkey he was riding. Easter in Ethiopia is called Fassika. Some children leave out carrots for the Easter bunny in case he gets hungry.